Having your car repaired or maintained is costly, so before you get all the work done on it, make sure to ask for the repair estimate. A car repair or auto repair estimate is a rough calculation of the how much the entire car repair will cost. This is not the exact or final cost of the entire repair service, but it gives the car owner an idea of how much they need to cover and choose a car repair services provider that will offer them better deals. In this article, we will provide you with steps on how you can write an auto repair estimate. Estimate samples and templates are also provided to serve as your guide or reference. 1. Select the auto repair template of your choice. 2. Thoroughly check the car or vehicle to be repaired. 3. Gather and record required and relevant information. 4. Analyze and calculate the damage. 5. Provide the total estimate. An auto repair estimate is similar to that of an invoice because it is issued upon request by the customer before payment is made. What makes them different is that an auto repair estimate is issued before the actual repair work is started and it does not provide the final payment amount. A good template will help you gather just the right information that you will need for the job. 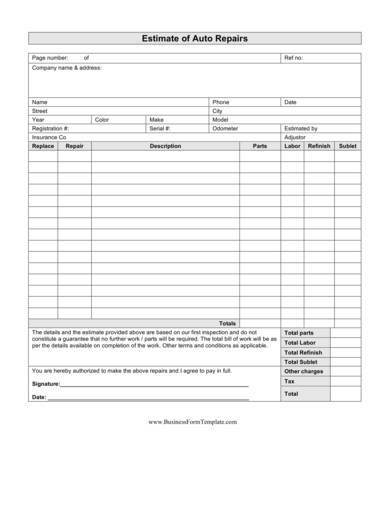 You can also use templates, like sample estimate request forms and repair quotation samples and templates. This is also where you will record all your findings or observations about the repair work to be done. If the institution you are working in uses a specific type of estimation template or has their own template, make sure to learn to use that one as it is required by the business. The next step is to conduct a thorough inspection of the vehicle needing repair. 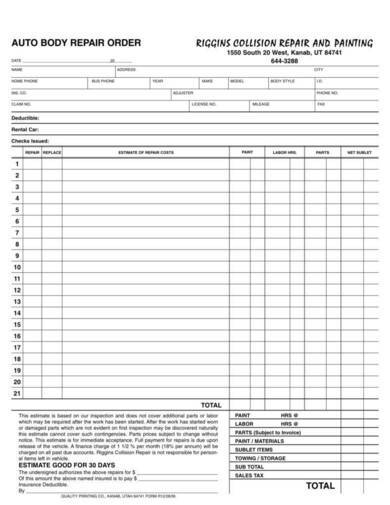 Use the template as your reference on what information are required to complete the template and that will help you get an estimate. After every inspection, you should always record the information that you have gathered. This is to ensure that your memory is clear about what you have checked. It will result to a better estimate and will help you identify the exact type of repair that the vehicle needs. You will have a very satisfied customer if you are able to do things right. Based on the information that you have gathered and using a standard estimation guide, could be one that is preferred by your employer, start analyzing and calculating the damage. Always double-check your work, and when in doubt, look for references that will help you. When you are finally done with analyzing and calculating, and when you have finished reviewing your work, provide the total estimate of the car or vehicle repair damage to your client. A collision takes place when a car bumps with another car or other stationary obstruction, such as a building, tree, pole, etc. It can cause damage to the car or vehicle that is why it will be needing repairs. For vehicle damages caused by a collision, an auto collision repair estimate template is used to compute how much repairs would roughly cost. The template includes all car registration-related information, car parts that will be replaced and repaired, hours of labor required, etc. Stated at the bottom of the template is the number of days the estimate is good for. 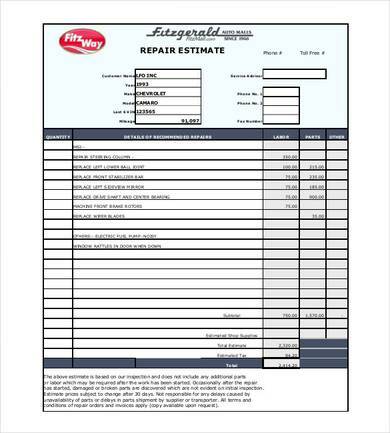 This auto repair estimate sample template will help you get your repair estimation job quickly and conveniently. The layout of the template is neat and simple, and enough space is provided for you to write on. 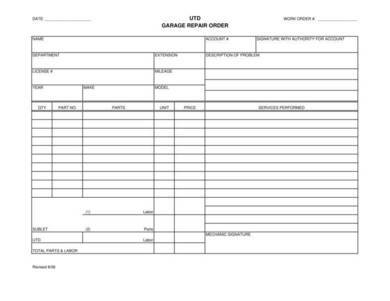 The garage repair estimate template is a very simple one-page auto repair template that can be used by different auto repair shops. The template is fairly easy to use and understand. The required information are put in a table so that they can easily be read and found. If you want to use this template as your own, you can change the heading to that of your auto repair shop’s name or logo. 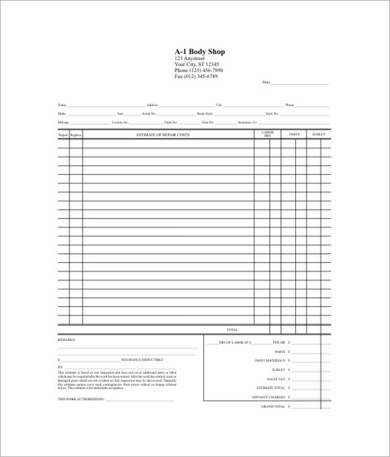 The body shop repair estimate sheet is available in Word making it easy for anyone to edit and make changes to the template. A title box is provided on top where the shop name, address, and contact details can be changed. The entire layout of the template is simple yet so nice to look at. The sample auto repair estimate template above shows the breakdown of the charges for repairing a Chevrolet Camaro 1993. As it is just an estimate, the required quantity for each item is not yet provided. A disclaimer is stating that other parts or labor that may be required once work is started is not yet included. Other information required in the template includes details of the recommended repairs, labor costs, cost of parts, total estimate, etc. 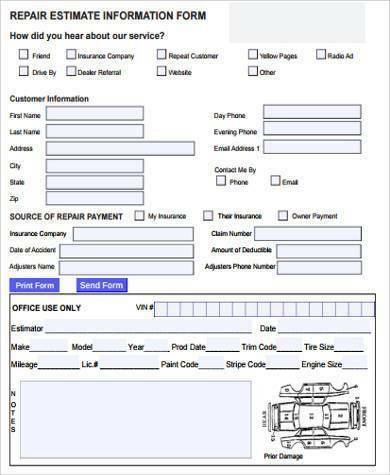 This one-page automotive repair estimate form has an attractive and neat layout. A short survey is asked at the top of the form before proceeding to the rest of the repair information. The other sections that make up the form include the customer information section, the source of repair payment, and the section where the estimator records the details about the vehicle and the needed repair to be done to it. 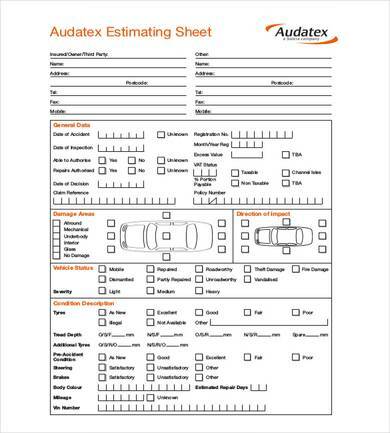 If you want a repair estimate template that is easy to use and makes your job a lot faster, then you will love this auto repair estimating sheet template. The template is very detailed and the details are also arranged in an organized way. Every section of the template is put in different boxes. Instead of writing down some of the details, check boxes are provided to make the task easier and save more time. Don’t you just find these samples and templates useful? If so, why not use them as your own or as your guide? Just make a few changes and you should have an auto repair estimate template done in no time! You may also check out other related articles, like Auto Repair Invoice Templates and Contractor Estimate Samples.